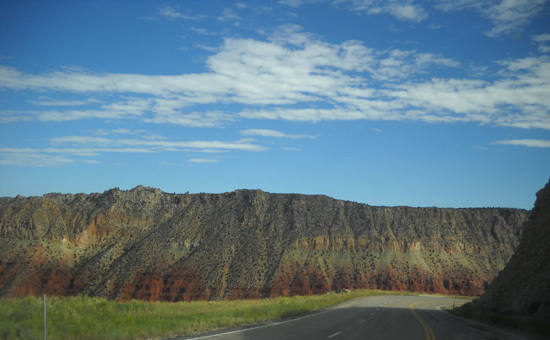 and Red canyons, which were carved through the Uinta Mountains by the Green River." 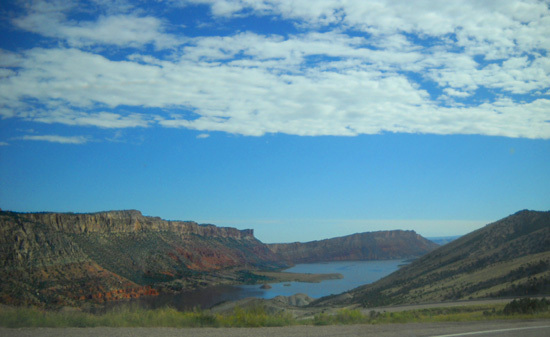 This was our first time in the Flaming Gorge area. It wasn't a destination; we were just passing through today. I'd like to spend more time here someday. 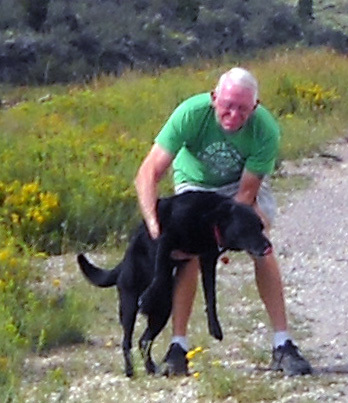 We reached Reunion Flat Campground on the west side of the Grand Teton Range this afternoon. 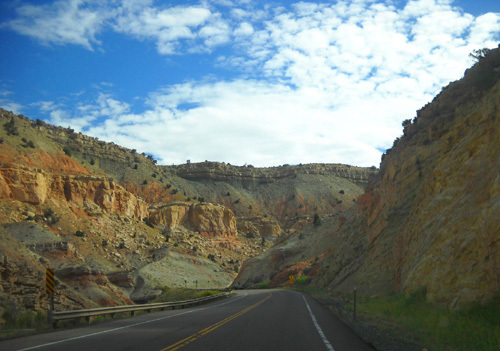 Almost all of today's drive was on two-lane, hilly, curvy roads; only a few miles were on a freeway. We also had to drive slowly through several towns. 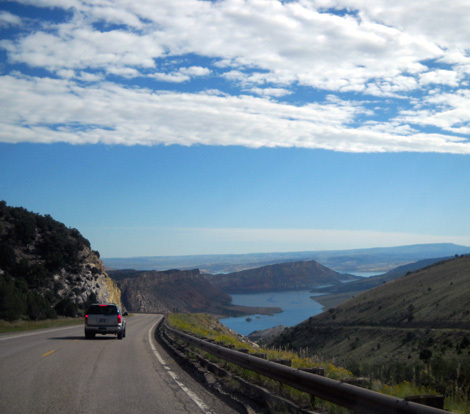 Our fuel mileage ranged from 6+ MPG going up 3,000 feet in a few miles from Vernal, UT to an average of 10 � MPG for the day by the time we arrived at Reunion Flat. Today's weather was great � sunny all day with very few clouds and some breeze. It was in the upper 50s in the morning to the 80s in the afternoon. 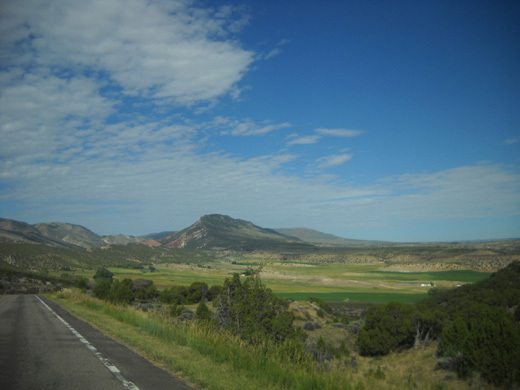 Elevations ranged from about 5,319 feet in Vernal to 8,428 feet a few miles north of there. We were mostly at 6,000 to 7,000 feet all day. That's where this page ends. I took a lot of photos today and I need to spread them out over two pages. 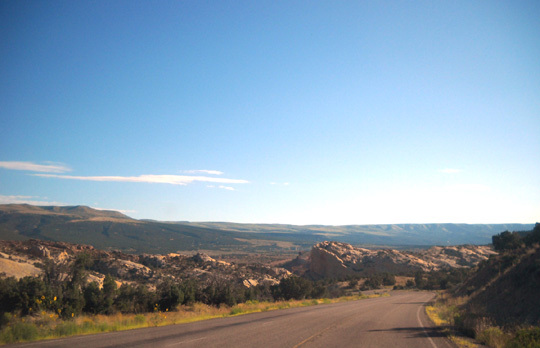 The second page begins at the UT/WY state line and chronicles the rest of today's journey to Reunion Flat. 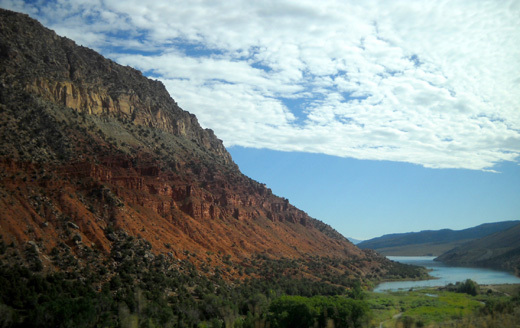 Reddish walls surround Flaming Gorge Reservoir. We left the Vernal, UT Walmart about 8 this morning, after a quiet night resting in their parking lot. We drove back east on US 40 about two miles to get to US 191 north. Before reaching that intersection we stopped at an RV parts and service store to get a new bathroom vent cover; ours was gone when we arrived at Walmart yesterday. It blew off somewhere during the day. Good thing it wasn�t raining! 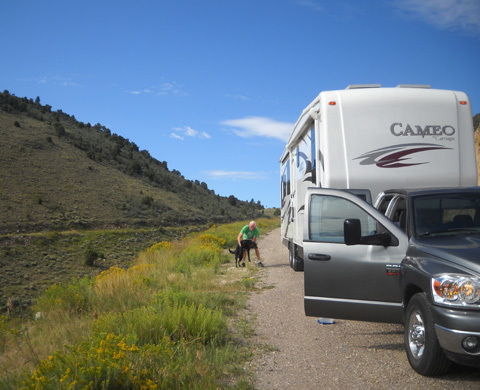 We were glad the shop was open that early because we didn�t see any other RV dealers or repair shops on our way to Teton Canyon. 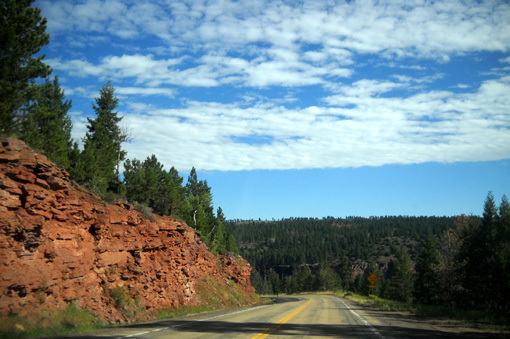 This is a good "red" road (i.e., national highway = more heavily-traveled) through the Uinta Mountains. 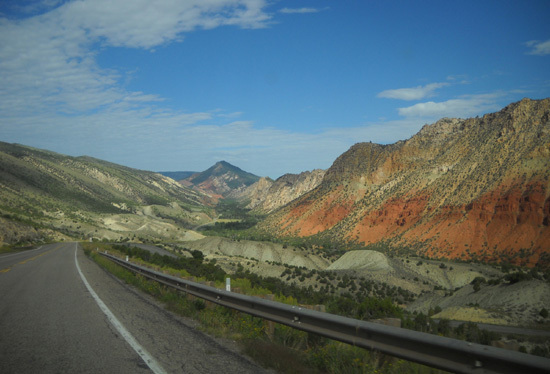 It is rather slow in an RV because of all the curves, distracting scenery, and almost 3,000 feet of elevation gain in the first few miles. The grade is not steep but it is pretty relentless. 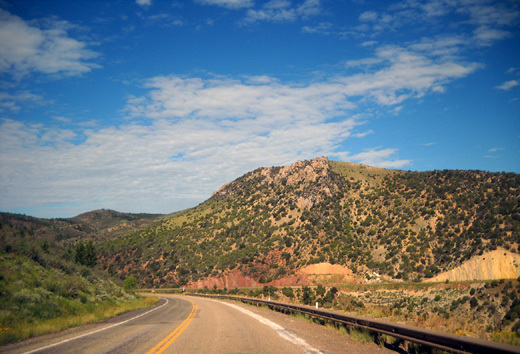 The highway is designated scenic on our AAA map for good reason. We passed two state parks in the first few miles. 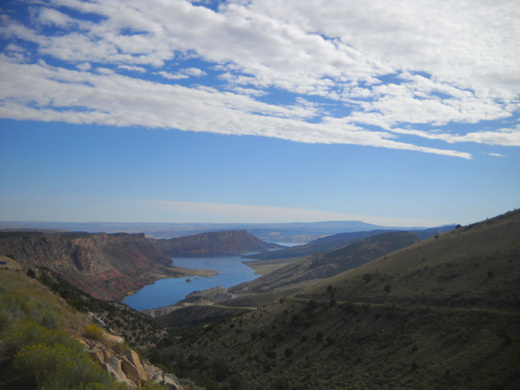 Steinaker SP, just north of Vernal, has a small, attractive reservoir. Red Fleet State park is a few miles beyond that. We didn't drive into either park. There was some traffic on this road but folks could pass us OK.
As we entered the huge Wasatch-Cache National Forest about ten miles north of Vernal the terrain completely changed around 8,000 feet elevation. 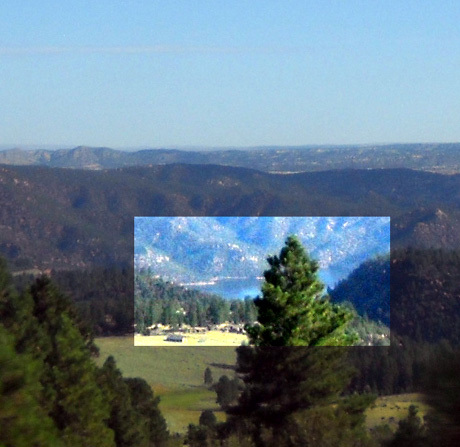 Here we entered a much greener world of pines, aspens, and broad grassy meadows. We had to stop twice for a road striping (painting) crew, then again for some paving work farther north. 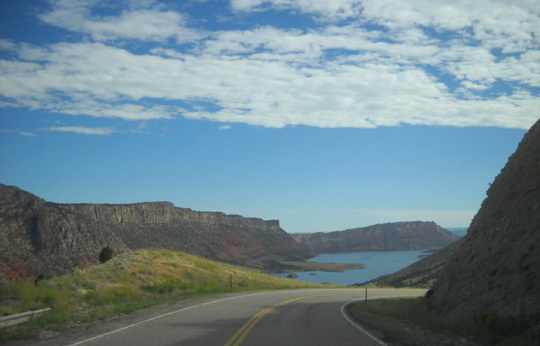 We passed several campgrounds before we got to the south end of Flaming Gorge. 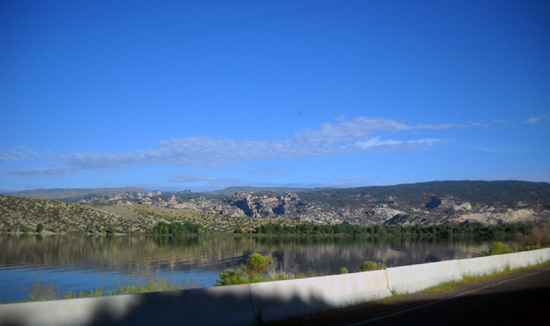 We didn�t have any views of the lake until we got on UT 44. 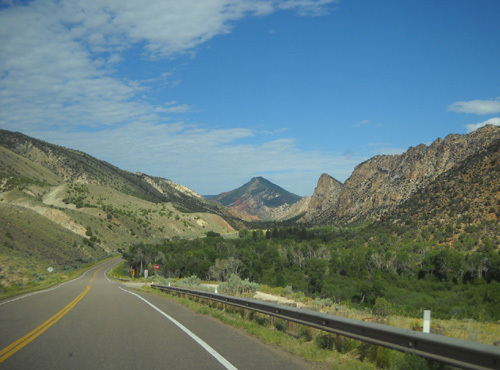 US 191 continues north on the eastern side of the gorge and intersects I-80 east of Green River, WY at exit 99. 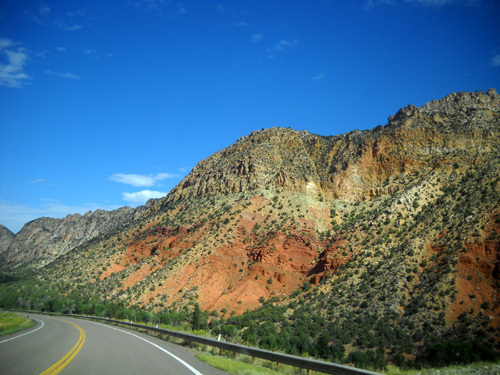 We chose to drive up the west side of the gorge on UT 44 and WY 530 because they are more direct the way we wanted to go and appeared to be closer to the lake. 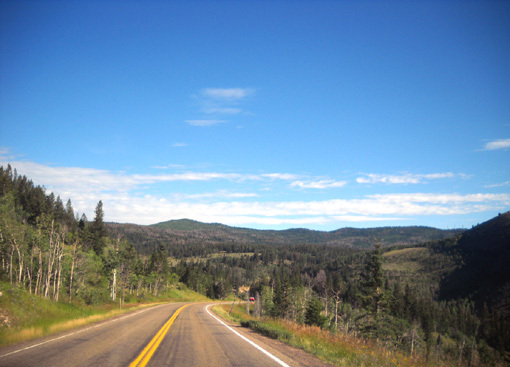 This state highway, a lesser-traveled "black" road on the AAA map, isn�t in as good shape as US 191. 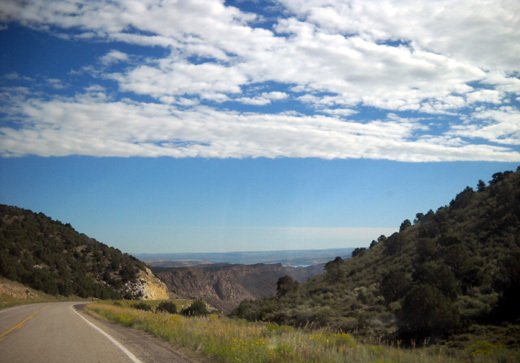 It is more narrow and we had to drive more slowly because it's open-range territory. 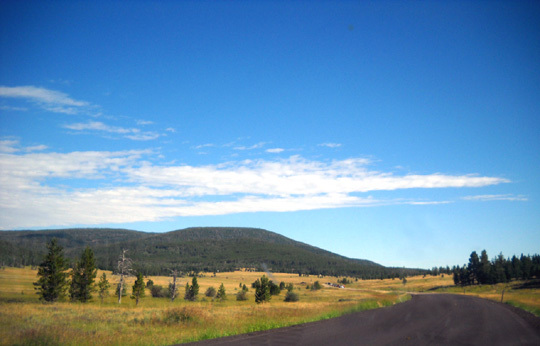 This part of the national forest is open range land. 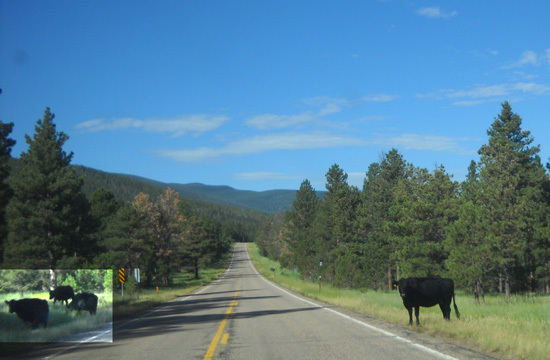 So were some of the other roads we drove on today but that was the only place we had to stop for cows. We'll have to come back another time, leave our camper in a campground, and drive around the rec area in just the truck to get more views. From UT 44 we could see snow on some 13ers in the Uinta Mountains to the west -- still there in late August. This was a high snow pack year throughout the West. 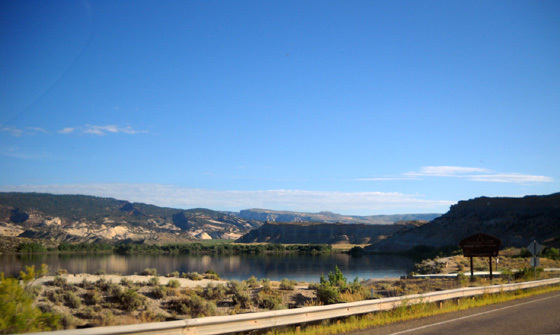 There is a large parking area in Sheep Creek Bay with plenty of room for RVs. 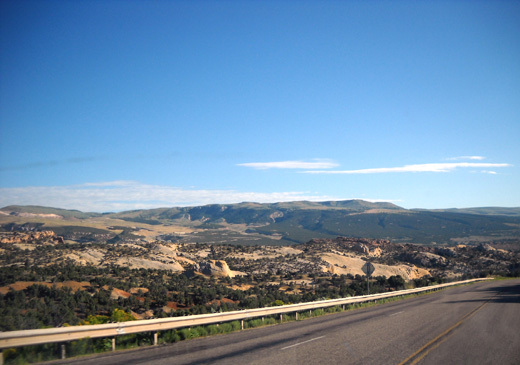 After reaching Manila we turned right on UT 43 and drove a couple miles east to reach the WY border and WY 530.